Author Hirahara to Speak in S.F., S.J. You are at:Home»English»Nor Cal News»Author Hirahara to Speak in S.F., S.J. Bike cop Ellie Rush dreams of becoming a homicide detective, but it’s still a shock when the first dead body she encounters on the job is that of a former college classmate. 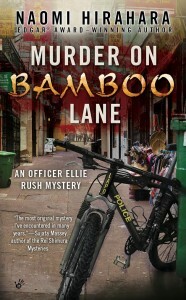 At the behest of her Aunt Cheryl, the highest-ranking Asian American officer in the LAPD, Elle becomes entangled in the investigation of the coed’s murder, only to uncover secrets that a killer may go to any lengths to keep hidden. Hirahara, born and raised in Southern California, is the author of the Mas Arai mystery series, which features a Japanese American gardener and atomic bomb survivor who solve crimes. The series so far consists of “Summer of the Big Bachi,” “Gasa-Gasa Girl,” “Snakeskin Shamisen,” “Blood Hina” and “Strawberry Yellow.” In contrast, the new series features a protagonist who is young, female and biracial. Hirahara’s “1001 Cranes,” a middle-grade novel, was chosen as an Honor Book for Youth Literature of the Asian Pacific American Award for Literature in 2009. • Saturday, May 17, at 1 p.m. at the Japanese American Museum of San Jose, 535 N. Fifth St. (near Jackson) in San Jose Japantown. Seating is limited. Email [email protected] or call (408) 294-3138 to reserve a spot. Freew tih admission to the museum — $5 for non-members, $3 for students and seniors over 65, free for members and children under 12. Info: www.JAMsj.org. • Sunday, May 18, at 3 p.m. at the Japanese Cultural and Community of Northern California, 1840 Sutter St. (near Buchanan) in San Francisco Japantown. Free admission. Info: (415) 294-4655 or www.jcccnc.org. Co-sponsored by the Nichi Bei Foundation, JCCCNC, San Francisco JACL and Nakayoshi Young Professionals. Funded by The Henri and Tomoye Takahashi Charitable Foundation. Hirahara will also appear at the Japanese American National Museum in Los Angeles on Saturday, May 24, at 2 p.m.
For more information on the author, visit www.naomihirahara.com.